The European Federation of Journalists (EFJ) today, in Kiev, calls on Ukrainian authorities to comply with their commitment to respect freedom and pluralism of the media. The EFJ joined the OSCE Representative on Freedom of the Media Dunja Mijatovic to call on Ukrainian government and Russian-backed separatists to increase efforts to ensure safety of journalists on the frontline of the war in east Ukraine. 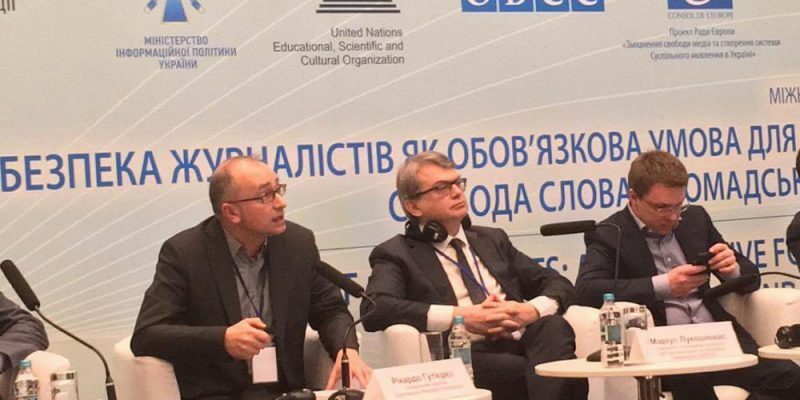 The General secretary of the EFJ, Ricardo Gutiérrez, is in Kiev today to attend the international conference “Safety of Journalists: An Imperative for Free Media, Freedom of Expression and Public Order” organized by the Ministry of Foreign Affairs of Ukraine together with the Council of Europe, the UNESCO, the OSCE and the Institute of Mass Information. According to the National Union of Journalists of Ukraine (NUJU), an EFJ affiliate, there have been approximately 800 incidents of attacks and threats against journalists in Ukraine since November 2013. “At least 10 media members have been killed,” said Sergiy Tomilenko, president of NUJU. “Given the dangers of any armed conflict, I urge journalists and media outlets to take all necessary precautions when reporting from conflict areas,” said Dunja Mijatovic. She mentioned the injuries inflicted on LIFE.ru cameraman Pavel Chuprin, on 31 January, and on British freelance photographer Christopher Nunn on 2 February.